A great meal creates a memorable experience. The sight, smell, taste, and even sound of a perfectly assembled dish can etch itself into the brain forever. If your business’s product is food, this is the exact connection that you hope to make with your customers. To excite their appetites, you need quality images and videos that showcase your delicious creations. However, just pointing your phone at the food you want to capture doesn’t always do the trick. The goal of professional food photography is to recreate these memorable sensations with just an image. Here are some secrets for ensuring you end up with quality food photography. The nature of your food item will dictate how much light and what type of light sources you should use for your photography. If you have a translucent beverage, like a clear cocktail, you may want to shoot with lower lighting and higher contrast to accentuate the liquid’s definition. A gorgeous, plated entree needs a principal light as well as a backlight to separate the food from the background of the frame. It’s important to ask yourself, “What makes this food item special?” If you’re featuring a plate of fiery nachos, you might want a warmer color palette. A decadent hot fudge sundae would best be scored by a neutral color temperature to allow the contrast between the ice cream and fudge to stand on its own. 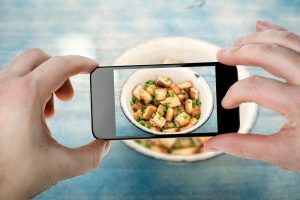 The most foolproof way to get your hands on some quality food photography is by hiring a professional. When you procure the talents of a professional photographer, you’re actually acquiring three things at once: skill, creative direction, and equipment. When it comes to quality images that will act as the face of your brand, hiring a professional is the way to go. Doug Davis is a professional photographer in Dallas with experience in food, product, lifestyle, and creative design photography. He’s worked with major brands to highlight everything that makes their products unique. For quality food photography services, contact Doug at D-squared studios in Dallas, TX at 214-746-6336.